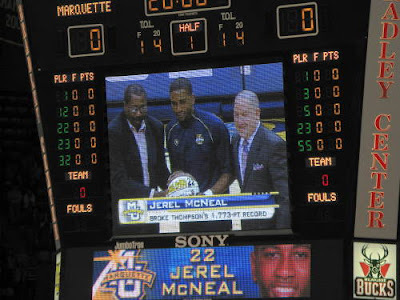 Marquette ended their two game losing skid with a Valentine's Day win over SJU, 73-59. Marquette has now won 10+ games in each of its 4 seasons of Big East play, and goes into their final 6 games with a 10-2 record. St. John's was able to keep up with the Warriors for the first 17 minutes, keeping the game a low scoring affair at 24-24, but Marquette went on a 17-2 run over the next 6 minutes, building a healthy 15 point lead that the Johnnies never seriously threatened. Prior to the game, McNeal was honored by George Thompson for breaking Brute Force's decades old record for most points scored. Jerel went on to score 20, with 7 rebounds and 5 steals. Lazar picked up the silver for 18, and 7, while DJ had a healthy 14 with 6 assists. Lazar was also honored pre-game, for his 1,000 point.